Two Colors, Three Quilt designs. Tokens of the Past is an ongoing pattern series featuring several small, doll size quilts, wall hangings or table toppers. 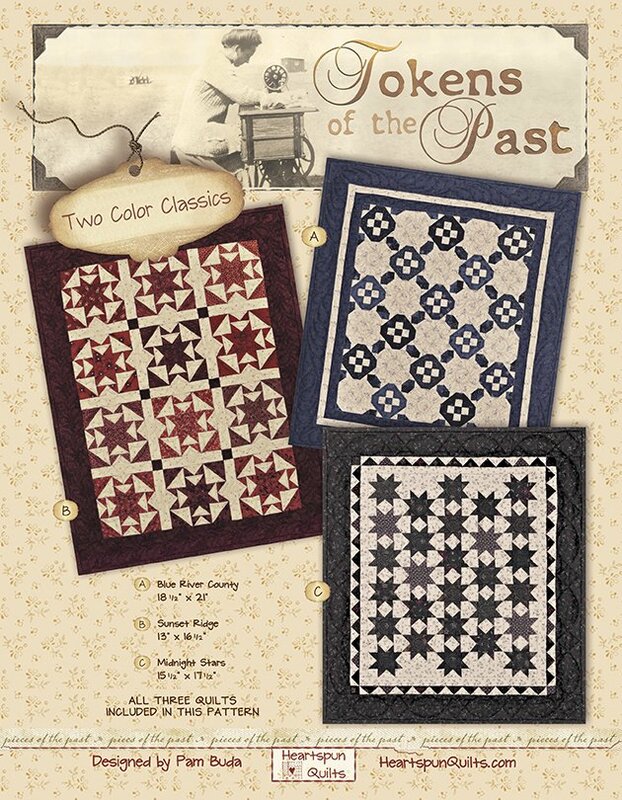 Two Color Classics is the eighth in the Tokens of the Past series, and features 3 small quilts, all made in the traditional, nineteenth century style of the classic two-color quilt. The pattern includes yardage and instructions for all three quilts. Blue River County: The block is a variation on a Churn Dash block, paired with a snowball block creating an interesting secondary pattern. The quilt measures 18 1/2" x 21". Please note: The Easy Angle ruler is required for this quilt only. I used it because it made it so much easier to create one of the units in the block using small pieces. Check with your local quilt shop or click here to order from my website. You will Love making the unit using this technique! Sunset Ridge: A wonderful star block variation, set with sashing, creates a Shoo Fly block secondary pattern! The quilt measures 13" x 16 1/2". Midnight Stars: Featuring a favorite Sawtooth Star in and surrounded by Flying Geese border, the unique layout give this quilt pizzazz! The quilt measures 15 1/2" x 17 1/2". Make these Two Color Classic quilts in any two colors of your choice. A welcome addition to your small quilt collection!